Today I start tracing the reverse of the course I traveled twelve days ago, heading from Kansas City, where many of my relatives live, back to the west coast, then on to Taipei where I connect back to Bangkok. It has been an exciting and busy twelve days. While I initially thought I would have a lot of free time on my hands, in reality I find myself not having blogged since the day of my departure and with a list of friends I have not had time to visit. 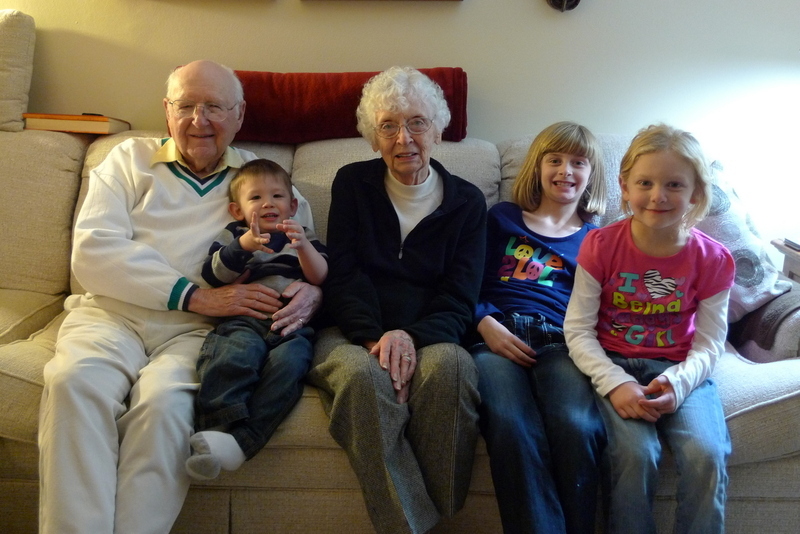 My grandparents with my cousin’s son and my two nieces. Most of the time was spent with family. My two nieces are here in Kansas City. They are now 5 and 8 and as they mature a bit (especially the older one), spending time with them is more interesting because we can do and discuss a wider range of things. We had time to bake Christmas cookies. I was a “mystery reader” at their school, going to talk to their classes about life in Thailand. I cooked several meals and had the extended family over. I had to spend a few days working. Anytime I’m in the US, my boss can’t resist the urge to meet me! That’s actually a good thing as it reinforces that I provide value to the organization and am worth a special trip. I also had the opportunity to meet a Xangan – Ruth Ann – who lives near Kansas City – and her husband Pat. They lived in Thailand for a few years in the late 1960s and Pat is fluent in the language. They are a wonderful couple and full of great stories about their experiences. Anyhow, my resolution upon my return is to re-engage with Xanga. There are lots of things I do that I document (photographs) but never take the time to write. And there are a lot of online friends whose blogs I have not been following faithfully. This entry was posted in Uncategorized and tagged family, travel by christao408. Bookmark the permalink. A is for apple! Also the mark I hoped to get on my exams. I was wondering where you were hiding. My compliments to you on a nice looking family. hope my comment goes this time. Xanga kept locking me out and eating my comments.You were only 5 hrs away from me If you are ever in St Louis area, and have time to meet up, I would so love to meet you and Tawn. I am glad you share with us. You have a great blog to read. Mystery reader? Sounds so fun! I love kids ;0) Thanks for the nice picture of your family. Beautiful looking family! I am sure the kids enjoyed your visit to the class and a chance to hear from someone who lived in a country they only hear about. And CHRISTMAS COOKIES YAYAYAYAY!! Sometime when you come to the US you’ll have to spend a bit more time! Glad to see you here, and moreso that you’ll be re-engaging with Xanga! Gosh, you seem to visit the US a lot! Your frequent flyer points must be high. 🙂 I’m not here often but if I’m not back before the holidays, hope you have a very happy holidays and new year! Glad to know you are back. I was already wondering where you were. So that’s what you’ve been up to! Sounds like a lovely visit!! I forgot that you travel a lot too! It must be exhilarating (and tiring) to travel such distances. It’s really nice that you are so generous with your time though. I may have to jump off Xanga for a bit to get some work done, so I may not get a chance to say this later. Have a very Merry Christmas and happy new year! I am so glad you had time to spend with your grandparents. It was wonderful to talk to you dear friend. I am so glad that you blog again. Love that family photo. Looking forward to more. How would it be to use the “photoblog” feature, while you’re too busy to write? Hmmm. That would probably take too much time as well. It’s tough to blog regularly let alone blog while traveling. When the time for blogging has been taken over by something else, it’s really tough to squeeze other things out. I’m glad you found time to visit and reconnect with family. @The_Eyes_Of_A_Painter – Thank you. Yes, I’ve been MIA. And I don’t mean Miami. Am increasing the frequency of posts and just spent a few hours reading subscriptions… barely scratching the surface! @CurryPuffy – I’ll have to share pictures of the cookie making. @awoolham – On some future visit, I hope to get over that way including a trip up to Quincy to visit Dr. Zakiah again. @ZSA_MD – Sorry I managed to call you at such an inconvenient time! =D@Ikwa – Thank you for the kind words; I’m glad you enjoy reading this blog. @slmret – You know, I would love it if I could split my time between the US and Thailand so that visits back aren’t so rushed. @brooklyn2028 – It works out to about twice a year, which doesn’t seem to be too terribly often. But, then, I guess it is a lot more than some people make it back when living overseas. @beowulf222 – @ClimbUpTreesToLookForFish – Sorry for being missing in action. @murisopsis – Indeed it was lovely. Too short, though. @Inciteful – That’s actually a good suggestion, provided I take the time to write a detailed caption. Of course, once I’ve done that, I’m 80% of the way to a blog entry. @icepearlz – Glad you liked the photo. More to come. @ElusiveWords – That’s very true. There’s a finite amount of time and we each have to choose how to spend it. @agmhkg – Thanks – you, too. @Redlegsix – It was my pleasure – please say hi to Pat for me. I think I’ve already made constructive steps towards re-engaging. Have had an entry about every second day, which seems doable.